No matter what you’re doing, the JAM Transit Micro Sport Buds are designed to stay in place comfortably. (Seriously, go ahead and do a backflip.) Multiple accessories allow you to create a custom fit, while the reflective strap enhances safety. They’re also sweat resistant, making them perfect for even the toughest workouts. Packaged in a matching, BPA-free water bottle. 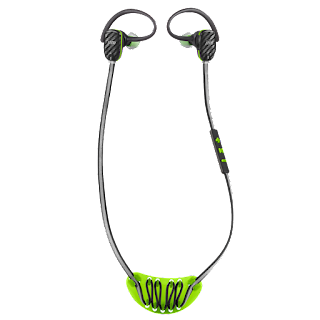 JAM Transit Micro Sport Buds take your workouts to a whole new level! Since moving into a rental home while our new home is being built I've had zero motivation to workout. I put these earbuds in and forced myself to get on the treadmill and turned on my music. I was completely blown away at the sound that the JAM Transit Micro Sport Buds produce! The sound is crystal clear and the bass is amazing. As a runner I love bass because it's ever so helpful to increase my speed. I simply select a quicker song and try to match my steps with the bass and with minimal effort I'm usually able to increase my speed. Being able to really hear the bass always helps me move around more whether I'm lifting weights, cycling, running or just cleaning the kitchen it's a very powerful tool to torching some calories. Another terrific thing about the JAM Transit Micro Sport Buds is that the cord never gets tangled and the earbuds stay in my ears while I run. And, since the JAM Transit Micro Sport Buds come with multiple accessories you can truly customize them so that they'll be extremely comfortable no matter what you're doing while you wear them. The JAM Transit Micro Sport Buds would make an amazing gift this Valentine's Day!